This article first appeared in the September/October 2016 print edition of Daughters of Promise Magazine. Perhaps now is the time to explain the housing arrangement in Paris. 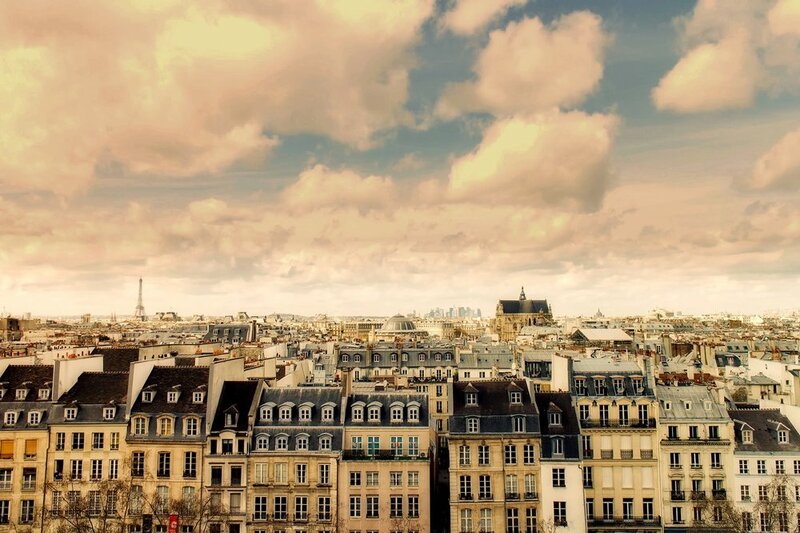 During this time, many Parisians lived in multi-level apartment buildings. Those who had economic status lived in the ground level apartments, for this way they did not have to contend with stairs. Now, above Alaire and Sophie's cozy basement there lived a wealthy fellow named Pierre. Pierre was a man who loved money more than anything else in the world. His favorite activity was to stay up late into the night, counting his coins and scheming how to make more and more money. By daybreak, he would finally fall into a contented slumber. Alas, though, after only mere moments of sleep, he would be rudely awakened by Alaire’s cheerful singing. Pierre found the constant warbling quite obnoxious, and began to plot how he might muzzle this resident songbird. One day, an idea came to him. He rubbed his hands excitedly. “I believe,” he said to himself, “that I just may have found the perfect solution to my problem." He clapped a hat on his head and headed for the bank. Meanwhile, Alaire was working and singing busily. Suddenly, he heard a visitor coming down the stairs to his shop. His hopes rose. Perhaps, he thought, this will be a customer who will be able to pay well and Sophie and I will have a bit of extra money. When the door opened, Alaire stifled a sigh. The visitor was only Renard, a longtime acquaintance. Alaire’s disappointment was soon swallowed by compassion, for Renard, with pleading eyes, asked Alaire if the cobbler was in need of hired help. You see, Renard explained, his child was sick and money was tight. With heart and voice brimming with pity, Alaire told his friend that he could not take on hired help; he was just glad that he had enough work to meet his and Sophie’s needs. A sad look came over Renard’s face and he turned and left the cobbler's shop, feet dragging dejectedly. Alaire resumed his work, his mind a confusing mix of regret that he couldn’t help his friend, and thankfulness at the miracle that he and Sophie had enough money to live on. Soon, Alaire heard footsteps again! Who could this be? Hope bloomed in his heart again. His mouth went dry when he saw that it was the rich neighbor that lived on the first floor of the apartment above them! This will be a big order, Alaire decided. Maybe a pair of boots! But Pierre, as we know, was not interested in any shoes. Instead he reached deep into the pocket of his fine coat, drew out a leather bag, and shook it vigorously. Alaire’s eyes grew big. The bag, he could tell, was filled with many francs! Pierre gestured at Alaire to cup his hands. Pierre emptied the bag into the trembling, bewildered hands. The coins clinked and gleamed delightfully in the soft light of the shop. Through a fog, Alaire heard Pierre tell him that this money, one hundred francs, was a gift; he could keep all the money and need never repay him. Alaire was speechless for a full minute. In fact, he was so stunned that he did not even notice that Pierre had left, as quickly has he had come. Suddenly, Alaire noticed a shadow pass the window. Gripped by an strong, unfamiliar fear, he swiftly scooped the money into the bag and made for the bedroom. He was afraid someone was looking down the window and would see this great amount of money! In the privacy of his room he slowly, savoringly counted the money. He heaved a gusty sigh of relief when he counted one hundred francs. Carefully, he tucked the bag under his pillow. Alaire suddenly heard footsteps outside the bedroom door. Sophie was home with the day’s groceries! So startled was Alaire that he greeted his good wife curtly. Confused by this strange behavior, Sophie inquired after Renard, who she had seen entering the shop. When Alaire related Renard’s request, she chided him gently. Surely they had something they could spare for the sake of that poor child! Alaire hastily reminded her they barely had enough for themselves; how could they be expected to care for others as well? Puzzled by her husband's sudden heartlessness, Sophie said nothing further. During the rest of the day, Alaire's mind was full of that money. He kept hiding the bag in different places and then going back to make sure that it was all there. The next morning, Alaire went about his work as usual, but there was no song. His mind was too full of the wonder of all that money. Above Alaire, Pierre slept undisturbedly. When he awoke late in the day, he chuckled happily. “I do believe that I have successfully quieted that racket!" he gloated to himself. As the days wore on, Alaire became more and more irritable, and Sophie became more and more baffled. Then one day, a dreadful thing happened. After hiding the beloved money in yet another place, Alaire couldn’t remember where it was. Suddenly, he was filled with an ugly suspicion. Sophie, he thought, has probably found the money and taken it for herself! He found her, shook her angrily by the shoulders, and inquired after the money. Bewildered, the good woman began to cry. Suddenly, Alaire remembered where he had hidden the money. And then in that moment, with blinding clarity, he saw what that money was doing. It was changing him into a suspicious, miserable, ugly monster. Filled with disgust, he retrieved the money from its hiding place, threw it on the bed, and, face damp with tears, told Sophie the whole story and asked for her forgiveness. Together, they decided to share the money with Renard and his family, as well as other poor families in their neighborhood. The next morning, one story above, Pierre jolted awake, not believing his ears. The offensive din that he had not heard for days was now clearly and joyfully wafting from the cobbler in the basement. Alaire was singing again! A decision is a transaction of exchange. When we give something that we have, we take on something in its place. Esau exchanged his birthright for a bowl of stew. Alaire’s exchange was his song for money. We affirm our hearts, knowing that it is foolish to exchange God given gifts for what appeals to the human heart of man. Once asking his mother for a definition of sin, John Wesley received a response fit for the theology books he was writing. “Take this rule,” she wrote to John. “Whatever weakens your reason, impairs the tenderness of your conscience, obscures your sense of God, or takes off your relish of spiritual things....that thing is sin to you, however innocent it may be in itself." These are questions to ask and live by, when asked, “How much for your song?" Will your exchange your song - your relationship with God - for money, for lust, for other relationships, for media, for pleasure, for sports...? You fill in the blank! Remember - as we see in Esau and Alaire’s lives - that we do not sin alone. Our transaction of exchange affects others. Make wise transactions; choose the song! Joseph Peachey is husband to Lois and father of five children; one son and four daughters. He lived in Honduras from age 11 till 28. At age 15, Joseph surrendered to Jesus as Lord and Saviour, and testifies that the journey of faith is good! He currently serves as associate pastor at Oak Hill Church in Cumberland, Virgnia. tagged with daughters of promise magazine, Christian woman, christian magazine, how much for your song?